Do you have one of these sitting in your cupboard? You may want to double check to make sure the meat (Can you even call it “meat”?) doesn’t look funny or have any “metallic pearls” embedded in it. A man found mercury pearls embedded in his SPAM a few days ago. 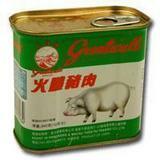 There’s been a recall and people are being warned not to eat this Chinese SPAM/ 長城牌午餐肉. Watch the Youtube video clip (in Cantonese) showing the mercury-contaminated SPAM here and more about the RECALL here. I’m not a big fan of canned foods. In fact, all I have in my cupboard right now are 2 cans of DelMonte pineapple chunks (from the US) and a can of Smedley baked beans (from England)- for emergency purposes, I guess. After a recall like this one, I cannot stress NON-PROCESSED, NATURAL foods more. Sure, we’ve got the pesticides and herbicides to worry about, but there’s the option of organic (straight from your garden!) and at least we’ve got fruit and vegetable washes available. The less processed the food, the better for your body. This entry was posted in News Update, Nutrition, Toxins and Our Health and tagged chinese spam mercury contamination, 長城牌, 長城牌火腿豬肉有水銀, 長城牌午餐肉, 長城牌午餐肉回收, mercury in spam, spam recall, 水銀. Bookmark the permalink.